British art has always been slightly different from that of mainstream Europe. Perhaps it’s because we’re an island. European painting in the eighteenth century is generally conceived as radiating from Paris. There was a strong move during the course of the 18th century towards the development of a national school – a desire for academies of art where the latent English genius could be nurtured. French Rococo portraits and decorative mythologies invaded Germany, the Scandinavian countries, and Russia and the French influence was powerful in Rome and Spain but as the French Revolution approached, France, in the person of Jacques Louis David, took over the leadership of the emerging Neoclassical style (which perhaps originated in Rome) and established its primacy killing the age of Rococo and the Baroque. The two great centres of resistance to Neoclassicalism are generally held to be Britain and Venice. During the 18th and 19th centuries, young members of the British upper classes broadened their education with the Grand Tour of continental Europe. They encountered a sophisticated level of artistic achievement that influenced their tastes as art patrons. To ensure similarly high standards in Britain, the Royal Academy was founded in London in 1769. 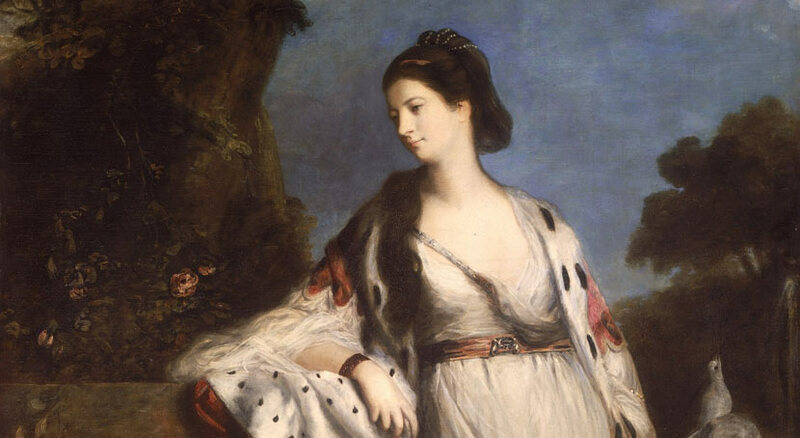 Its first president was Sir Joshua Reynolds, a brilliant painter as well as an influential teacher and author whose Discourses authoritatively addressed many aesthetic topics—including the preeminence of history painting. Landscape and romanticism were two key themes of two masters, John Constable and J.M.W. Turner. Constable’s true-to-life views of the verdant English countryside emphasized the essential harmony and purity of nature. Turner, on the other hand, was a romantic who expressively dissolved forms in terms of light and atmosphere. With their fresh vision and powerfully original styles, Constable and Turner profoundly influenced the work not only of many subsequent British painters but of countless other American and European artists as well. The death of court painter Sir Godfrey Kneller in 1723 brought to an end the long dynasty of foreign artists who had dominated English painting for two hundred years. Kneller’s pupils and followers were conventional ‘portrait manufacturers’, whose work had neither life nor charm. It was left to his pupil and son-in-law, William Hogarth, to restore English fine art painting to dignity and honour. The young artist William Hogarth broke the mould of Britsh art in the 1730s when he began his series of moral fables in paint. Hogarth’s earlier style, although strongly personal, is an English variation on the style of the French Rocco painter Watteau and his contemporaries but Hogarth’s moral fables fit in exactly with that climate of Enlightenment thought which was to produce Diderot and the Encyclopedists. William Hogarth dominates English art in the first half of the century. Scornful of portraiture, he single-handedly created a new genre, the ‘Modern Moral Subject’, and introduced the original practice of paintings and engravings in series, and of telling a visual story. Hogarth is called a moralist and a genius and is acknowledged as the first great English painter of modern times, but in his own lifetime, he waged a perpetual struggle for recognition and patronage in a society indifferent to native talent. He was the son of a schoolmaster and literary hack and born at Ship Court, Old Bailey in 1697. About 1712 his father apprenticed him to Ellis Gamble, a silversmith in Cranbourne Alley, Leicester Fields, from whom he learned something of the processes of engraving. He took to drawing, it is said because he wished to record the humours of London life as he saw them. 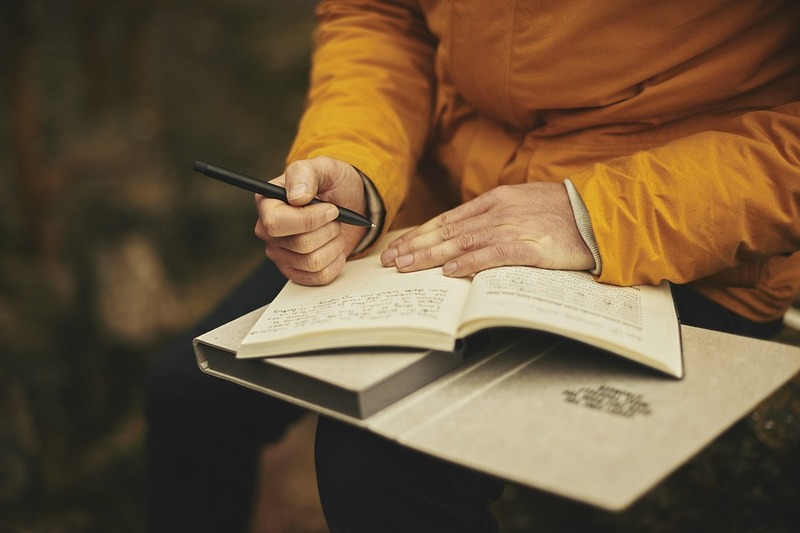 He devised a system of drawing from memory so that he could record in the evening the things he had seen during the day. This, he believed, was the only way ‘living art’ could be produced. In 1733 Hogarth settled in Leicester Fields, where he remained for the rest of his life with the exception of a brief trip to France in 1748. His trip resulted in the picture of “Calais Gate”, now in the National Gallery but while making a sketch of the old gateway Hogarth was arrested on a charge of espionage and, though subsequently released, the incident had the effect of confirming his truculent insularity which finds full expression in this picture. Towards the end of his life, Hogarth contrived to produce satirical engravings and paintings. He also painted a fairly large number of portraits, and a few pictures in the “grand historical style”, which are not on a level with his other work. Late in life, he published his “Analysis of Beauty”, in which he expressed his own aesthetic ideals, and endeavored to establish a definite canon of taste. In 1757 he received some official recognition in his appointment as serjeant-painter to the king, but he died on 26th October 1764, four years too early to become one of the foundation members of the Royal Academy. Illustration: The Ladies Waldegrave. Reynolds was particularly skilled at choosing poses and actions which suggested a sitter’s character and which also created a strong composition. Here, three sisters, the daughters of the 2nd Earl Waldegrave, are shown collaboratively working on a piece of needlework. The joint activity links the girls together. 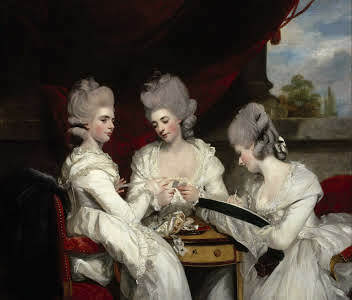 On the left, the eldest, Lady Charlotte, holds a skein of silk, which the middle sister, Lady Elizabeth, winds onto a card. On the right, the youngest, Lady Anna, works a tambour frame, using a hook to make lace on a taut net. Sources: Ellis Waterhouse, Tate Gallery, London National Gallery Scotland. The Duchess of Hamilton was born in Ireland, Elizabeth Gunning. She was a celebrity beauty who caused a sensation when she and her sister were introduced into high society. Though the sisters had neither dowries nor rank, their physical attractiveness secured them excellent marriages. Elizabeth married the Duke of Hamilton on St Valentine’s Day in 1752, only weeks after meeting him at a masquerade. This is a graceful portrait by the neo-classical painter, Gavin Hamilton, who was a distant relative of the Duke. Hamilton also produced an elegantly-draped full-length portrait of Elizabeth. In late 1740 or early 1741, the Gunning family returned to John Gunning’s ancestral home in Ireland, where they divided their time between their home in Roscommon and a rented house in Dublin. According to some sources, when Maria and her sister Elizabeth came of age, their mother urged them to take up acting in order to earn a living, due to the family’s relative poverty. The sources further state that the Gunning sisters worked for some time in the Dublin theatres, befriending actors like Margaret Woffington, even though acting was not considered a respectable profession as many actresses of that time doubled as courtesans to wealthy benefactors. However, other sources[who?] differ and point out that Margaret Woffington did not arrive in Dublin until May 1751, by which time Maria and her sister Elizabeth were in England. 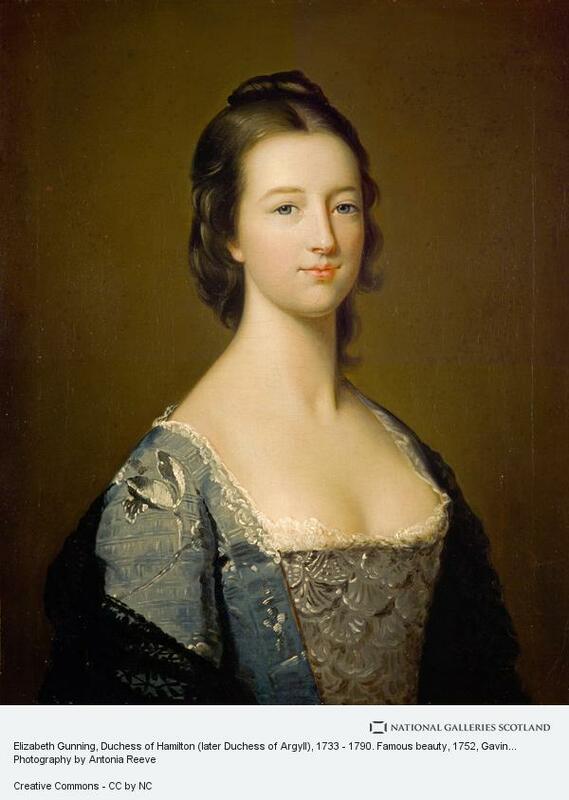 In October 1748, a ball was held at Dublin Castle by the Viscountess Petersham. The two sisters did not have any dresses for the gathering until Tom Sheridan, the manager of one of the local theatres, supplied them with two costumes from the green room, those of Lady Macbeth and Juliet. Wearing the costumes, they were presented to the Earl of Harrington, the then Lord Lieutenant of Ireland. 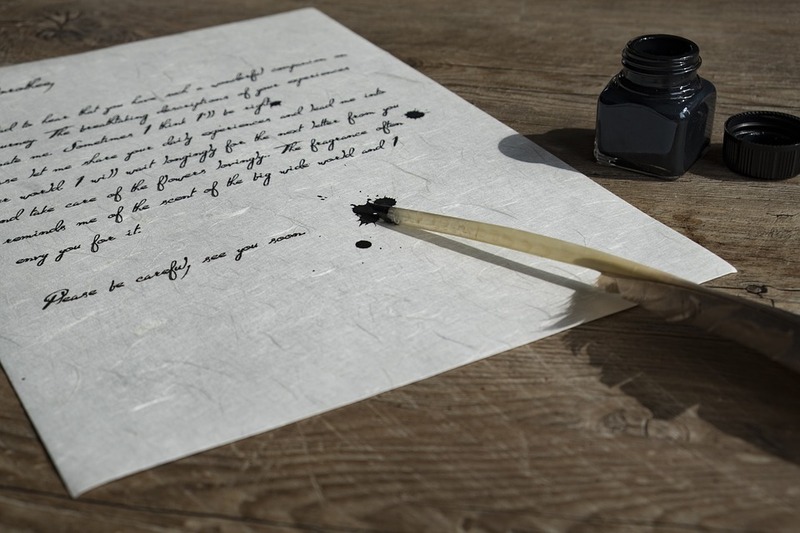 Harrington must have been pleased by the meeting as, by 1750, Bridget Gunning had persuaded him to grant her a pension, which she then used to transport herself, Maria, and Elizabeth, back to their original home in Huntingdon, England. With their attendance at local balls and parties, the beauty of two girls was much remarked upon. They became well-known celebrities, their fame reaching all the way to London, with themselves following soon afterward. On 2 December 1750, they were presented at the court of St James. By this time, they were sufficiently famous that the presentation was noted in the London newspapers. Elizabeth was also immortalised in portraits by Gavin Hamilton a distant relation of the Duke. The Palazzo del Re was home to the exiled Jacobite court and the Stuarts in Rome. Owned by the Muti family, it was rented by the Papacy for the Old Pretender, James Francis Edward Stuart. Both James’s sons, Charles Edward (‘Bonnie Prince Charlie’) and Henry Benedict, were born in the palace. The event depicted here is a celebration organised in honour of Henry’s appointment as a cardinal deacon on 3 July 1747. James, wearing the blue sash of the Order of the Garter, is shown greeting his younger son, who is dressed in the black coat, scarlet stockings and shoes with red heels often worn by cardinals in the eighteenth century. The palace itself has been lavishly ‘dressed’ with temporary architectural decoration, somewhat like a theatre set. During their long exile, the Stuart dynasty commissioned a steady stream of portraits and subject pictures as propaganda for the Jacobite cause. The Portrait Gallery has an extensive collection of images of the deposed King James VII and II and of his son Prince James and grandson Prince Charles Edward (‘Bonnie Prince Charlie’), many of them of high quality by the leading artists of the day. This picture occupies a special place among this wealth of material. It is large, colourful and celebratory but the apparently joyful mood here belies some harsh political truths. In reality, the painting captures a moment when the Jacobite ambi­tion of re-establishing a Stuart monarchy in Great Britain was effectively at an end. After their disastrous defeat at Culloden in 1746, the Stuarts were left politically isolated and vulnerable. In Rome, Prince James, the Old Pretender, finally acceded to the desire of his younger son Henry to become a Cardinal, immediately guaranteeing not just a degree of status but also much-needed financial security for the family. But for Henry’s older brother, Charles Edward, this pragmatic move was a catastrophe. By linking the Stuarts so closely to the papacy, it was clear that any hope of reviv­ing Jacobite sympathy back in Britain was now fatally undermined. Charles Edward refused to return to Rome and never saw his father again. Our picture was commissioned to celebrate Henry’s appointment as Cardinal in 1747. 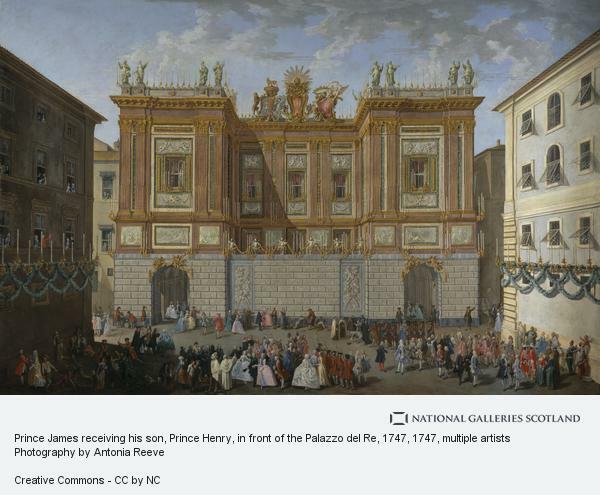 In the foreground, James, wearing the bright blue Order of the Garter, stands with his court outside his residence, the Palazzo del Re, to greet his son, shown in a cardinal’s costume of black coat and scarlet stockings. A recent papal regulation required that new car­dinals should decorate their home with a false façade and provide a fete for the local populace. In the background, the palace is dressed with temporary architectural decoration to create an elaborate backdrop for the celebrations, with the arms of the English monarchy and the papacy promi­nently on display on top of the palace. The foreground is filled with incident to evoke a festive if somewhat unruly mood among the onlookers. Alongside the fashionable courtiers here are parading soldiers, beg­gars scrambling for coins and even some figures fighting. Elsewhere, musicians are preparing to play while food for a banquet is carried into the palace. Until comparatively recently, the identity of the maker of this work was uncertain and it carried a traditional attribution to Giovanni Panini, the great Italian painter of topographical views. After it was acquired in 2001, an examination in the Gallery’s conservation studios indicated that more than one artist was involved in painting the figures as well as the background, and it now appears to be the work of three minor artists. It is nonetheless a fascinating document in which pomp and theatricality, colour and noise, mask the poignant significance of the event for a dynasty now destined to remain permanently in exile.